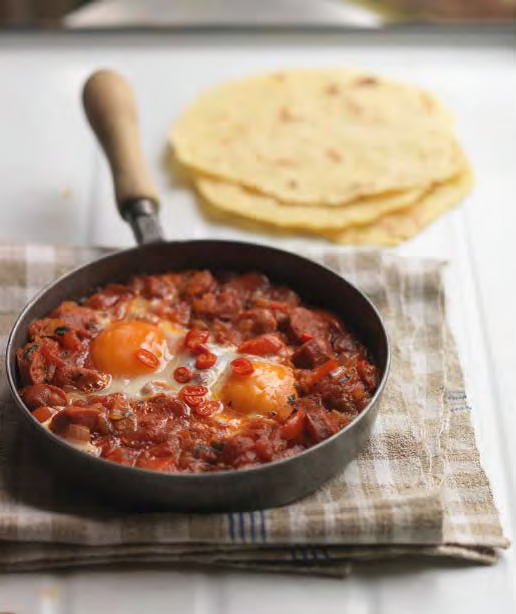 This is a classic hot Hispanic breakfast recipe, which uses Swiss Deli Spanish Chorizo. It will set you up for the day nicely. You will need a small to medium frying pan with a lid. 1. Fry the sliced Spanish Chorizo for a few minutes over moderate heat, then add the onion and pepper, and continue to fry for five minutes or so, until the fat has been released from the Spanish Chorizo. Give the mixture an occasional stir. 2. Add the tomatoes, oregano and a little salt if you wish. Simmer for ten minutes. 3. Make two indentations in the sauce and break in the eggs. 4. Place the lid on the pan and continue to cook over low to moderate heat for three to five minutes until the eggs are done to your liking. 5. Place the pan on the table and serve yourselves. 6. Warm corn tortillas are an essential accompaniment.